Celia has been teaching in the USA and Internationally since 2000. She was on the staff at LA YOGA magazine for four years as executive assistant to Julie Deife, creator and editor. Home based in Los Angeles, California until life moved her to Paris, France in 2015, she taught weekly classes at Golden Bridge Yoga Hollywood. She was the resident Yoga teacher at award-winning Cornerstone Theatre Company in Los Angeles for six years with Bill Rauch as artistic director. Her extensive and distinguished private clientele have included Samuel Goldwyn Jr. , Peggy Anne DiCaprio, Gustaf Skarsgard, Leslie Tamarabuchi (California Institute of the Arts), Johanna Went, Tom White (International Documentary Association), Eric Berg (Kingsgate Films). Many in the entertainment field but not exclusively to. Celia enjoys working with all ages and levels on the Yoga path, with a sweet spot for the beginner. Celia Anne has a special interest in the humanitarian effort, social justice and cultural diversity that includes the full spectrum of spiritual traditions and the many ways we perceive and make sense of the world we live in. She was inspired by the writing of Krishnamurti at age nine and was always drawn to the mystical, even through some wild years as a youth in Brooklyn, New York. Particular study and contemplation in Tibetan Buddhism, Taoism, Kashmir Shaivism Tantra, the Wise Woman Tradition, Native American Shamanism, Brazilian Spiritism, Ayurveda, The Divine Feminine, A Course In Miracles. Many paths that have led to one. Her quest has led her to travels which have included North America, India, South America and Europe. She completed her original training at Center For Yoga in Los Angeles. She is a certified Jivamukti teacher, the method conceived by Sharon Gannon and David Life and has also been profoundly inspired by and completed advanced training in Prana Flow with Shiva Rea. Other remarkable teachers have included Daniel Odier, Paul Ortega Muller, Swami Shankardev Saraswati and Christopher Tompkins. Frank White who taught one of the most challenging classes at age 80, Micheline Berry, Steve Walther, Mark Whitwell (Heart of Yoga), Siri Sevak Kaur (Kundalini Yoga) and her first Yoga teacher Mary Flinn at the neighborhood yoga studio in Brooklyn. Creative. Innovative. Open-minded. Open-hearted. 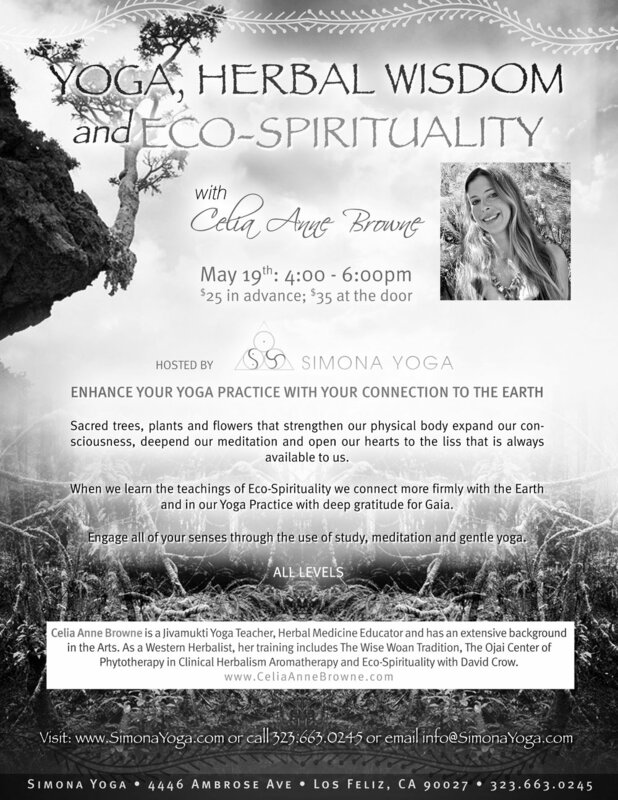 Our sessions with Celia are a journey to flexibility, strength and loving kindness.